KANSAS CITY, Kan. – AJ Allmendinger knows where he’s going to be working for the next five years. It’s the same place he’s working now. Allmendinger confirmed Saturday during a press conference at Kansas Speedway, site of Saturday night’s SpongeBob SquarePants 400, that he has signed a contract extension that will keep him in the seat of the No. 47 Chevrolet of JTG Daugherty Racing through the 2020 season. Allmendinger said that “it was a no-brainer” to sign the new contract when it was presented to him by team co-owner Tad Geschickter. In fact, the 33-year-old driver said, when he was handed the contract, he flipped right to the back page and signed without of reading it. All seriousness aside, Allmendinger said the only two problems he had with the contract was that it called for him to call Geschickter “The Man” and that he had to give the boss additional “mulligans” on the golf course. Allmendinger has posted two victories in 10 NASCAR XFINITY Series starts and had two top-five finishes in 13 NASCAR Camping World Truck Series starts. His lone Sprint Cup victory came at the Watkins Glen International road course last year. He said he thinks the one-car JTG team can – or will – regularly compete with the bigger, multi-car teams. Allmendinger, a former open-wheel driver in the Champ Car Series, is in his second year with JTG Daugherty Racing. Last season’s win put Allmendinger and his team into the season-ending, 16-driver, 10-race Chase for the NASCAR Sprint Cup championship playoff. Allmendinger was 11th in points heading to the final race, which was at Homestead-Miami Speedway, but a wreck slowed him and he ended the season ranked 13th in points. 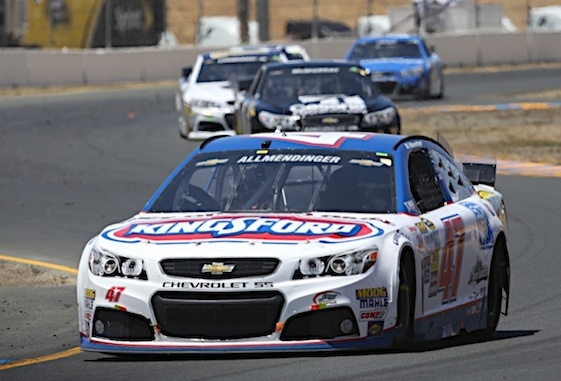 Allmendinger arrived in Kansas City this week sitting 19th in points. His best finish of the season was sixth at Las Vegas Motor Speedway. That followed a seventh-place finish at Atlanta Motor Speedway the prior week.